I bet when you decided to have children, you didn't think of them as arrows. I know I certainly didn't. Everyone enters into parenthood either by mistake or on purpose. Whether you planned your pregnancies or happened upon them...the Bible says that children are a heritage of the Lord. It doesn't say that if you planned your children, they are a heritage of the Lord, it simply says children are a heritage. As a home schooling parent I truly enjoy and cherish the time that I have to spend with my kids. Don't get me wrong, they are not easy on some days and they are not perfect on most days, but being able to watch them grow day in and day out and being able to slow time down just a bit by home schooling them, has been a thrill and an absolute enjoyment more than anything else. For that, I am eternally grateful. However, no matter how passionate I am about raising my kids, teaching them and spending time with them, the days are steadily approaching where they will leave my nest and expected to be strong, mature, productive adults in our society. I home school and train them with this in mind daily. Accompanying that reality is the thought that they will leave me one day. In fact according to an analogy found in the Bible in Psalms 127 versus 3-5, they are like arrows in a quiver. An arrow is symbolic of protection in this verse but also entertain the idea that an arrow has only one action of purpose...to be shot or aimed and released to a specific place or destination or destiny. So while the temptation to coddle them too long and keep them tightly tucked in my proverbial bosom is in me. I must keep in mind that they belong to God and that He has a purpose for their lives. That purpose will undoubtedly lead them away from the safety and security that I provide for them day after day, year after year. However through this verse of scripture I find peace. Peace knowing that as I raise my children to honor God, they will prosper where ever they go, once my job is done. I find peace in the fact that they don't unaccountably fall out of my nest but that they are very purposefully trained, aimed and released for God's will and His glory. This all goes hand in hand with my final scripture reference for this post...Proverbs 22:6 in the NLT and Message translations respectively. God bless and thanks for reading...linking up here. * For our family's FREE Educational music...visit our YouTube channel here. What a beautiful post and I so agree with you, my friend! As I read your post, my oldest son is driving home from his fiance's house (she lives with her family two hours away). They are in the throes of wedding planning. My youngest son is driving home from work. So both my babies are in but out of the nest, so to speak. But I know how we raised them and how we pointed them to the Lord, and now I trust that we've done our job. The rest is up to them. We continue to pray for them, and are blessed that they both love the Lord and are actively involved in our church. As you said, we pointed the arrows and we know that God has a wonderful plan for their lives! Good stuff---I wholeheartedly agree! Hope you're having a nice week. I've posted the new Homemaking Party for the week and would love to have you link up, if you'd like! Great post! I love your analogy and yes, posting them in the right direction is the reason we are here! Insightful post. :) Parents truly serve as the arrows that'll point their children in the right direction. 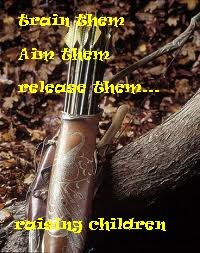 Rearing one's child in a balanced, lenient or forceful environment, can also be compared to that of an archer's grip on his bow. Thanks so much for sharing! Good good thoughts ad insight. Thanks for sharing with us at Eco-Kids Tuesday!! Hope to see you again today! Steph this is the most beautiful post. I am in tears right now. As a new mother I am always looking for balance in raising my, now two, kids. Thank you so much for sharing and stay blessed! What a blessing that you are able to stay home with your children and guide their footsteps during the formative years of their lives! Love this Steph! Our "arrows" are close to leaving the nest. I find that during this season of parenting our prayers are heavily ramped up. We may release the arrow but oh how important it is to pray against winds that may push it off course! Thanks for joining us at Inspire Me Monday!